You can add Single Reviews for any platform or any reviews and testimonials for your business from any source. 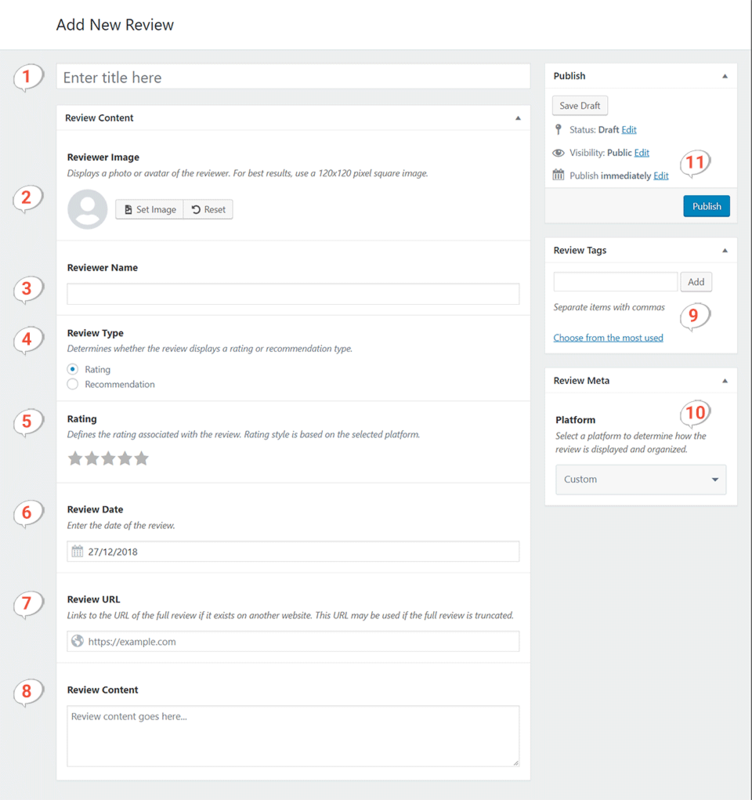 An annotated overview of the WP Business Reviews Single Review edit screen. To add a Single Review, on your WordPress dashboard navigate to Reviews > Single Reviews and click the “Add Review” button toward the top of the page. Add an image (upload an image of the reviewer, or use a logo or other custom image if you don’t have a photo for them). Depending on whether you choose a “Rating” or a “Recommendation”, here you’ll set either a number of stars or “positive” or “negative”. Enter the date of the review. If there’s an online link to the original review add it next. See our docs on finding the review links for Google, and Yelp. Add the review text under the “content” area. You can add a tag if you’d like to use this review in a tagged collection. If this review is from Facebook, Google, or Yelp, you can select the platform, otherwise, leave it as the default (custom). If you choose a social media platform that has existing Collections from specific “Review Sources”, you’ll see a “Review Source” dropdown appear. Read more about how Single Reviews are added to existing Collections.